Industry-wide, stock levels of U.S. light vehicles reached near-record levels of 4,197,800 units on July 1st, the highest since July 1st, 2004. Compared to June 2017, that represents an increase of 0.4 percent or 354,200 units and an increase of 5 days supply to 74 days. And compared to July 2016, the industry saw a 9.2 percent increase in stock levels in July 2017. GM’s 272,700 units made up the overwhelming majority of the 354,200-unit increase in July inventory levels industry-wide. By comparison, all other carmakers added 81,500 units, an increase of 2.6 percent. Overall U.S. light vehicle sales decreased 2.1 percent in the first half of 2017 compared to record-setting 2016 sales volumes. For its part, GM states that it is intentionally building up vehicle stock in preparation of plant retooling operations that will see the facilities shut down or slow production. The automaker has been providing this line for the last several months. In its initial explanation, GM said that it expected inventory to begin falling and be down to roughly a 90-day supply by July 1. That did not happen, as stocks rose to 105 days, an increase over the 101-day supply in June 2017, and 72-day supply in July 2016. GM spokesperson Jim Cain told Automotive News that GM is on track to reach its goal of a 70-day supply by the end of the year. Growing inventories and high factory incentives typically serve as indicators of forthcoming production cuts. As such, industry analysts are expecting further output reductions across the industry, though few have been announced as of this writing. Growing inventory levels also serve as a precursor to rising incentives, something over which the new, post-bankruptcy GM has been exhibiting significant control and discipline during the last few years. In June 2017, GM inventive spending was below all American automakers and in line with Japanese rivals. Hence, it is currently unclear whether GM’s inventory pile-up is actually part of its strategy or a cause for concern, given that the automaker has not met its own goal of decreasing inventory by July. It will be interesting to see what state GM’s inventory situation is in by the end of the September December 2017 quarters. Follow further coverage of this topic and other GM news right here at GM Authority. The market is saturated. Even mass TV advertising is not helping. The industry has been down this road before and it will be ugly again. Prices of cars on the lot have outstripped the average American’s stagnant wages. I see it at car shows. People oohing and awing over cars then freaking out over the MSRP. I do it too and I earn an income way over the U.S. median. I get GM sticking to a high margin marketing strategy. As a GM stockholder it makes me happy. As a potential car buyer with a strong bias towards purchasing GM products I’m not interested. 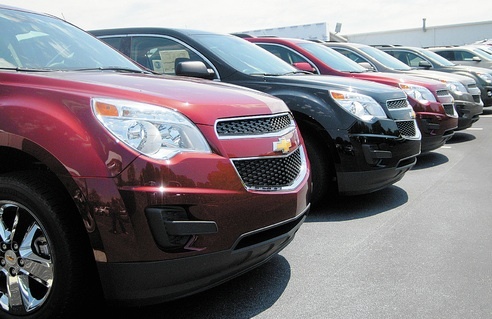 GM is struggling to sell these cars except on a discount. Now that they have so much sitting on lots they may discount them further at end of year. Steve is right on. I’m a retired baby boomer that owns a Camaro and Tahoe. Think I will EVER be able to afford new ones?!? 10,000 BBs per day are joining me in retirement. The LAST thing in the world we are thinking about is spending $50-80,000 on a new vehicle. This isn’t a cyclical downturn that will come back. It is a secular demographic reduction that will continue to reduce demand for at least another decade. In many cases, since people are retired and not working, they are also not putting as many miles on their vehicles since there is no work commute on a daily basis. …and the boomers (like me) are the ones that should have the the cash to spend on a new vehicle. We had our chance to make money before globalization killed the middle class, plus our inheritance from the Greatest Generation. Supposed glut of used cars, too. Not a rosy picture, I think. GM having their factories running at capacity makes them money , however now they have a glut of unsold vehicles and are extending shutdowns at plants to adjust to a market that is slowing . Their over optomistic forecast now has them in trouble . They are going to have to unload the 17’s to make room for the ’18 MY . They will loose money doing this and loose money running factories at less than optimal capacity . GM tried to tell shareholders and the market that this was planned , but we can clearly see that was not the case . Their financing arm GMAC , will make money by getting consumers to finance their vehicles with 0% term loans for 60 to 72 months . It is happening already . In an article in the WSJ , they stated that GM has a ” years ” supply of Buick LaCrosses to sell . That is evident at just about every Buick / GMC dealership where those cars sit . This news is good for people wanting to buy right now , bu the market doesn’t like what is going on at GM . ‘Intentionally building up vehicle stock’ of 2017s, just in time for the arrivals of 2018s. In a softening market? Help us understand the soundness of that business plan. My new vehicle (all GM) purchases were ’95, 97, 99, ’03, ’13. Being older and having my employer go bankrupt in ’09, having to move and start over with a mortgage, etc., kind of put a crimp in my buying sooner as I used to do. I don’t plan on buying now until ’23, even if the dealer wanted me to in ’16. Incentives can’t overcome reality for many people. If the quality of these cars was better they would sell them. Looking down my street, there isnt a single GM car in in anyone’s garage or driveway. There is a huge gap between GM’s quality and GM’s perceived quality that GM has been struggling to overcome. GM’s quality has improved but not relative to other automakers. In my neighborhood, there are no new GM vehicles. GM continues to put out half baked products that are good but not great. No one aspires to a GM vehicle like they do for a BMW, Lexus, Audi or even Toyota. We have all been burned too many times to risk that kind of investment with GM. Got a “private offer” from Chevy good for $1000-$5000 off any new car or truck by the end of August. Wish I could use it. My 2007 Tahoe is too good (still) to trade and my ’14 2SS Camaro Vert will last the rest of my life. Is this quality? I have no need to convince anyone. The simple fact of my ownership experience is that I will never be without a Tahoe as long as I drive. I do take good care of it but it is 10 years old with 115,000 miles and drives beautifully. How many have you owned? I will never consider owning a Tahoe. I rent them from time to time when needed and believe me not once did they held up. The last one my employer rented for me a 2016 after only 1 week of light desert driving the rental company replaced it because of fuel smell and squeaky suspension. For the type of work that I do GM doesnt have anything in its line up that can holdup to the daily light drive. Only 1 Japanese manufacturer manufactures trucks that can hold up to the light desert driving that we do.